Here’s a list of the kit I had packed for a trip the other day. I haven’t gone to the bother of weighing everything individually, it weighs what it weighs if it’s something I need. I’m more bothered about how much space things take up. Saying that I do try to buy light kit in the first place. * – As I don’t really plan on riding through the night while bikepacking. The Maxx Daddy would be a lot better in a night time emergency though. Maybe I should carry it? Square of foil backed bubblewrap, to sit on and pack the bag out better too. Nature Valley muesli bars x 3 (I’d be better off with these on my back and putting my toolkit in there). It sounds like a lot of stuff on my back but half of the main compartment is empty…perfect for carrying extra riding clothing if needed. Most of the stuff in it is what I would carry on a normal ride anyway. The mesh pockets on the side allow you to grab snacks while still riding too. I’m quite happy with everything, the only things I’m planning on changing are the seat bag for a custom frame bag. That’s so I can drop/get behind my saddle on technical descents. I should be able to fit my tent in there too. At the moment the width of my bar bag is determined by the tents packed size (without halving the mini carbon poles). With it out of the bar bag, I’ll be able to put my spare clothes in there with my sleep setup. It will then be packed up a little smaller, giving me more space around my brake levers and less weight up front too. I’ll need to do something about losing the bottle mounts, probably opting for a collapsible water bottle and filter instead. How do you transport your bike to the trailhead? Do you own a car bike rack? I normally use a roofrack with 3 carriers fixed to it when going mountain biking or bundle the bikes in the back of a mates van. 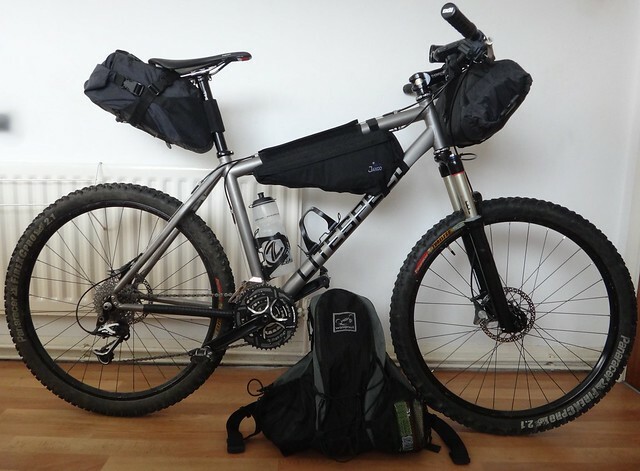 I haven’t needed to use a vehicle (except a train) when going bikepacking. I’ve only done a handful of one-nighters, always setting off from home. I’m lucky enough to live on the edge of a National Park! Cool setup! What type of Litespeed are you riding? Thanks. It’s a 2010 Obed. Does the double twist have a front pocket? How big is it? Rhino – Yes, it has a simple, elasticated mesh pocket that measures 140x90mm. I think the bloke who makes them has started doing custom work too…there’s a pic of the same bag with a more substantial pocket that closes.